NORTH KOREA HAS released American student Otto Warmbier from a 15-year sentence of hard labour after he stole a propaganda poster from a hotel. The 22-year-old’s parents have told reporters that their son has been medically evacuated in a coma from the reclusive country. “Otto has left North Korea,” his parents Fred and Cindy Warmbier said in a statement published by CNN. He is on Medivac flight on his way home. Sadly, he is in a coma and we have been told he has been in that condition since March of 2016. We learned of this only one week ago. The announcement of his release comes amid high tensions between Washington and Pyongyang following a series of missile tests by the North, which have triggered tightened UN sanctions. 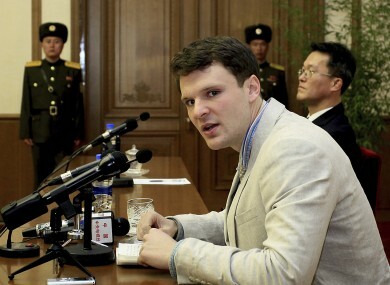 The United States had accused the North of using Warmbier as a political pawn and condemned the sentence as far out of proportion to his alleged crime. Tillerson told US senators at the start of a budget hearing that the State Department had no comment on Mr Warmbier’s condition, “out of respect for him and his family”. Warmbier’s release came after flamboyant former NBA star Dennis Rodman arrived in Pyongyang, having told journalists that US President Donald Trump would be happy with a trip that was “trying to accomplish something that we both need”. The former basketball star has visited the Stalinist state at least four times before, most recently in 2014 when he attracted a deluge of criticism after being filmed singing happy birthday to his “friend for life”, leader Kim Jong-Un. It was not immediately clear whether Warmbier’s release was connected to Rodman’s latest trip, which he has previously described his trips as “basketball diplomacy”. A senior Trump administration official earlier told Fox News Rodman was going to the North “as a private citizen”. Warmbier, a student at the University of Virginia, was arrested for removing a political banner from a wall in a North Korean hotel during a visit. At a press conference before his trial, a sobbing Warmbier said he had made “the worst mistake of my life” and pleaded to be released. The other US citizens currently being held by North Korea include Kim Hak-Song and Tony Kim, both professors at the Pyongyang University of Science and technology. They were arrested this year for “hostile acts” and trying to “overturn” the regime. Korean-American Kim Dong-Chul was arrested in 2015 and sentenced to 10 years’ hard labour on charges of subversion and espionage. The North has occasionally jailed US citizens and released them only after visits by high-profile political figures including former president Bill Clinton. Clinton in 2009 flew to Pyongyang to negotiate the release of US television journalists Laura Ling and Euna Lee, jailed after wandering across to the North from China. A year later, another former US president Jimmy Carter visited the North and won the release of American national Aijalon Mahli Gomes, sentenced to eight years of hard labour for illegally crossing into the North from China. Email “US student released from North Korea prison in a coma”. Feedback on “US student released from North Korea prison in a coma”.